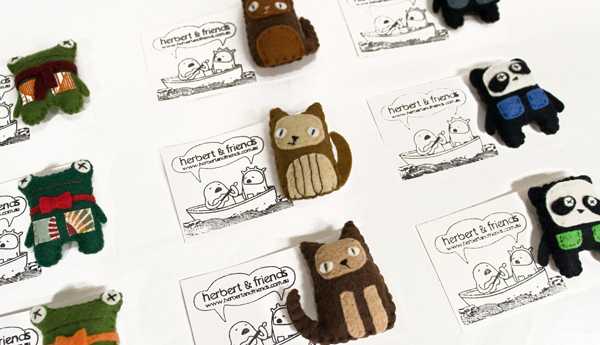 FK talks to Torunn, creator of Sydney based toy label Herbert & Friends who was at the last Finders Keepers in Sydney. Introduce Herbert to the world! Who is he and where does he exist? 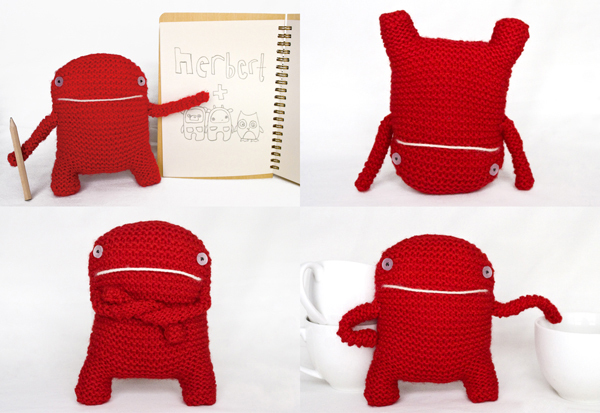 Herbert is a little red monster-creature who came into existence in August 2008. He was the third creature I made and the first one I kept (the other two were presents for friends). Herbert is incredibly charming and lovable, I used to take him to markets with me so I could introduce him when asked who Herbert was, but he would unintentionally steal the limelight and people would fall in love with him. They were never too happy when I explained he wasn’t for sale. Now he doesn’t go out much; instead, he hangs out on the bookshelf with his friends, causing mischief and helping out with the business when he finds the time. How do you think your Swedish background has inspired the label? An aspect of Swedish culture that has influenced my label is its idyllic, fanciful and light-hearted nature, with folk stories of gnomes and other forest dwellers, never-ending summer nights, mushroom picking in autumn, and candle-making in the silent snow-covered winter. The Swedes have a very strong tradition in children’s fiction, and I grew up with all the Astrid Lindgren sagas, together with those of Elsa Beskow, Selma Lagerlöf and Tove Jansson. It’s left me with a love of fantasy and story-telling that comes out in my work. Swedish design is also something that inspires my label with its simplicity, crisp lines, combinations of bold colours with earthy tones, and often nature-inspired patterns. Each time I visit Sweden I swoon over the fabrics! 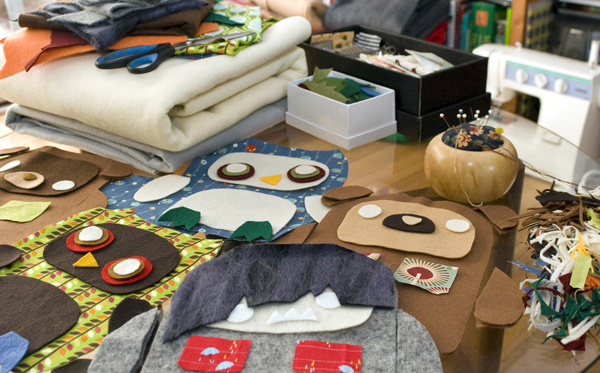 How did you come across the world of craft and felt, and what made you persist with it? I have always been a fairly crafty type of person. I was going through one of my knitting phases when I passed a bookshop window where I saw a book of patterns for amigurumi (the Japanese art of knitting or crocheting small stuffed critters). I was really excited because I hadn’t come across anything like it before, so I bought the book and off I went into the world of creature making. 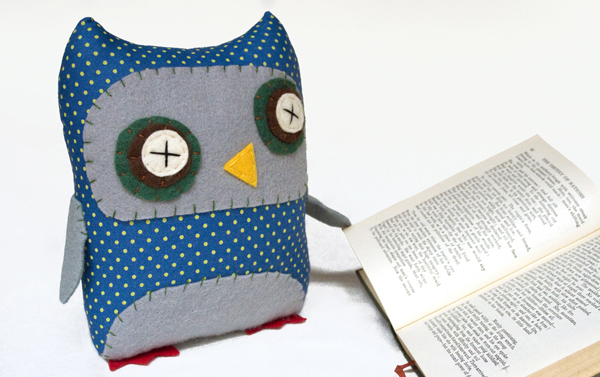 It didn’t take long before I discovered the Softies book and moved onto felt, which is easy to sew, a lot of fun, and much quicker than knitting! I’ve never been very good at following patterns, so I quickly deviated, changed patterns, and adapted them to my whims. I then started doing my own scribbles and sketches, transforming them into 3D creatures which came to life and took on their own personalities. It was the pure enjoyment, excitement and satisfaction of making things that made me persist. I just love the transformation from original design to little creature. What parts do you find challenging running your own business? As boring as it sounds, time management is quite a big challenge for me. I tend to get carried away doing the fun things like designing, sewing, taking photos, and reading about what other plush makers are up to, so the less exciting things like administration, finances and marketing get left to the last minute. It can also be overwhelming to have so much responsibility, and at times I can feel defeated by the enormity of having my own business, especially if I’m in a bit of a creativity rut, which can happen from time to time. Luckily I have really supportive people around me, and more often than not, I find running my own business amazingly empowering. What do you do in Sydney when you need some inspiration? My background is in Fine Arts, so I draw most of my inspiration from art – particularly installation, sculpture and drawing. I love going to galleries and seeing the result of people’s creative adventures: it really gets me excited about making things. I also love going to markets, predominantly handmade and second-hand ones, and seeing what little gems I can find. Friends are also a great source of inspiration for me; whether it’s intentional or not, my softies definitely take on aspects of my friends’ personalities. Where will 2010 take Herbert and his furry little friends? Something I’ve been wanting to do for a while is make limited edition story books about Herbert and his friends and their adventures together. This will be a collaboration with my sister, using the print Gocco I was given for Christmas. I will also be focusing more on making larger art pieces with the aim of putting together an exhibition towards the end of the year, or early next year. My range of softies will continue to evolve, and I hope to have a series of underwater creatures before too long. 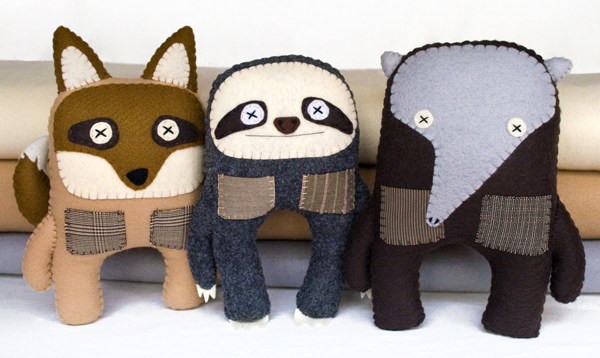 Herbert and friends are the cutest softies! I love that each one has their own little character and story, so adoreable. thanks for sharing your story! i saw some of your work at the last Finders Keepers – love them! they have so much character! love your fabrics as well!! look forward to the story book! 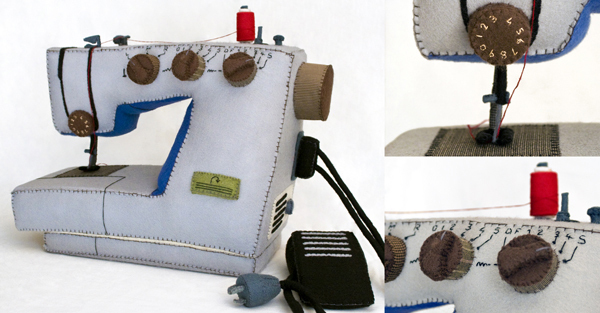 That sewing machine is a masterpiece! I love Herbert’s antics and his friends.